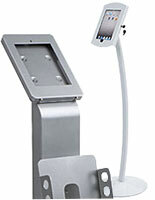 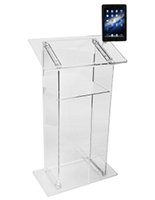 39" x 39" x 19.5"
Which iPad podiums are best for commercial, retail, or presentation needs? 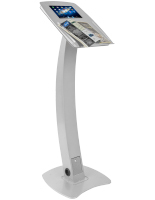 The answer depends on what function the fixtures will be performing, and in what type of location. 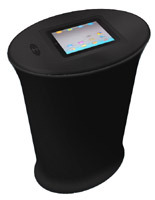 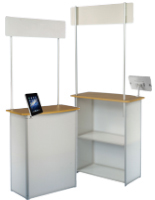 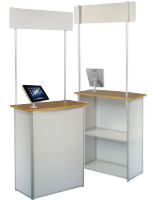 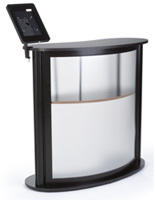 Our freestanding iPad podiums run the gamut from simple lecterns with attached device enclosures for displaying speech or lecture notes to high-tech secure tablet stands with swiveling brackets and high traffic POS stations in stores, showrooms, and trade show booths. 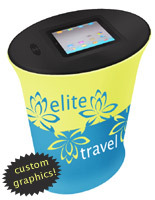 Apple and Android touchscreen devices present customers with apps and programming that serves a wide variety of purposes. 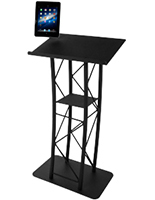 Our selection of pulpit-style tablet display furniture is designed to meet the needs of almost every business, facility, or organization. 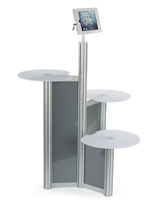 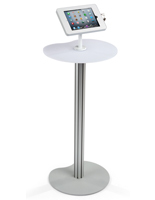 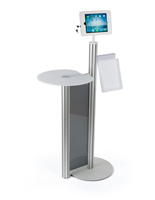 Commercial quality iPad podiums, also called freestanding lecterns with tablet mounts, are a great choice for use in hotels, restaurants, trade show booths, lobbies, churches, conference halls, school classrooms and auditoriums, and retail showrooms, to name only a few locations. 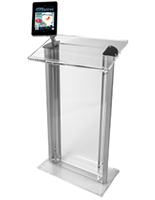 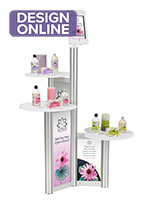 From locking enclosures with moveable clamp brackets to open-access mounts bolted to portable counters, Podiums2go.com offers the best selection of floor standing presentation fixtures with integrated tablet holders. 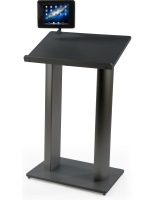 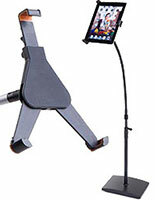 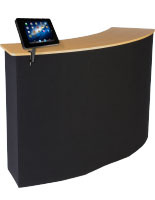 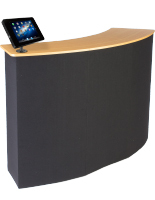 What are common uses for commercial-quality lecterns with tablet mounts? 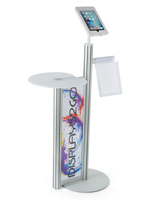 Touchscreen devices long ago created a revolution in how businesses do business. 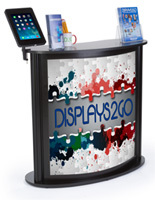 Commercial point of sale kiosks, interactive merchandising and inventory search applications, public wayfinding, and multimedia trade show presentations are only a few of the many ways Android or iPad apps connect customers and companies. 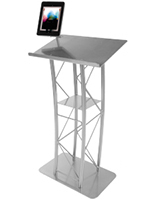 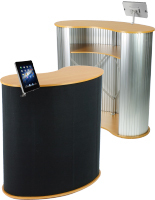 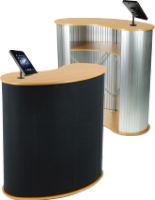 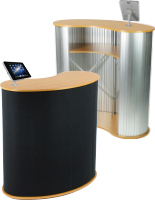 Todays freestanding podiums with iPad and tablet holder attachments allow traditional-looking lecterns and pulpits to integrate technology for notes and keyword displays, reference materials, presentation slides, and to even function as checkout or cash register fixtures in retail and commercial environments. 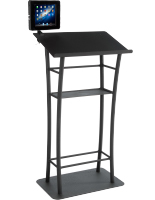 This versatility makes these secure tablet stands ideal for use as trade show kiosks, church pulpits, and conference or facility fixtures in addition to serving perfectly as lecture or reading lecterns. 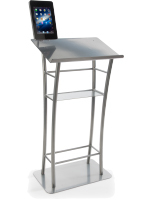 Freestanding tablet stands are available in several styles to meet different security requirements in public and private business environments. 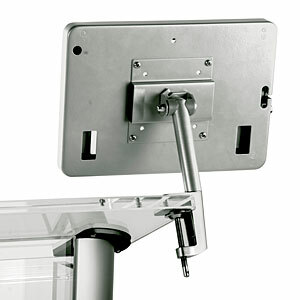 Locking display enclosures protect devices from being removed from the bracket, and are available in styles that either block or allow access to Home button functions. 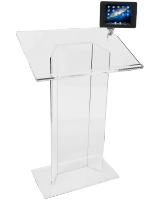 Mounting brackets either clamp directly to the podium frame or lectern top for easy repositioning, are built into the lectern stand itself, or are permanently attached using screws or bolts. 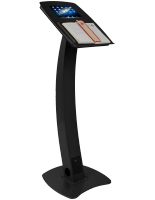 Different style iPad and Android touchscreen mounts offer different security measures that enable businesses and organizations to choose the display style and amount of programming access that makes sense for their needs.